dear friends Snowed-in wintry days are the best for crafting, don’t you think? The whole world takes a mandated break. Things that would be pressing on ordinary days are much less so. Hot cocoa is sipped. Fireplaces are aglow. Alarm clocks are silenced. You’re quite safe to stay in your pajamas well into the afternoon, for who in their right mind would fight through this weather to drop in on you? And you are free to spend entire afternoons piddling away at the kitchen table, crafting something extraordinary. And then later in the season, after the excitement of the snow day wanes, isn’t it the anticipation of Springtime and its flowers and gentle warmth that gets us through even the wintriest of days? The world may seem frozen in expectation, but the truth is that even now, under the frozen ground, the meekest little seed is starting its stretch toward its sprouting. Just like that little seed, we at Inspired Ideas have been crafting a veritable wonderland in the expectation of Spring. You won’t believe your eyes when you see the host of things we’ve made to share with you. Amazingly inventive crafts that will inspire you to spend all your snow days happily crafting away, making the most beautiful things ever. All rights reserved. No part of this magazine may be reproduced in any form without written permission of copyright owner. All images contained within have been reproduced with the knowledge and prior consent of the artists concerned and no responsibility is accepted by the publisher, Inspire Co. for any infringement of copyright or otherwise arising from the contents of this publication. Every effort has been made to ensure that the projects within this magazine are original. Copy templates (found in appendix) onto chipboard. Cut two ear pieces and one of each of the others. For the 4 batting pieces, cut each piece 1/4" larger than template pieces. Trace insole piece onto the print fabric. Cut out along line with regular scissors. Glue to one side of chipboard insole piece. Hot glue batting pieces to chipboard pieces, as shown. Be sure then to curl shoe tip piece into cone shape, overlapping about a 1/2" in the back. Hot glue fabric covered insole and shoe tip pieces together as shown, with overlap placed in the back. For the outer sole batting piece, pink the edges, and hot glue to the under side of slipper as shown. Cut 7 pieces crepe paper streamers, 3" long, for forehead fluff. Cut 14 pieces crepe paper streamer 2" long, for cheek puffs. Separate cheek pieces into 2 stacks of 7 each. Place a tiny dot of hot glue in center of each piece, glueing one piece to the next and so on in each stack. Using decorative edge scissors cut each stack into a circle, just by going around and trimming off corners. Then clip between each bump to the center, being careful NOT to go thru the center as shown. Ruffle up edges to create cheeks. For Forehead FluffStack the 3" pieces together and run small bead of hot glue down center of each length-wise to glue stack together. Trim stack edges with decorative scissors, clip between bumps as done in the cheek pieces, being careful NOT to cut thru the glue line in center. Fold in half, lengthwise, and ruffle. From wool scrap, cut two small circles,and hot glue heart beads to centers for eyes. Cut tan chenille into pieces as shown for eye brow, eye spot,and nose. Hot glue all features as shown. Spread thin layer white glue on exposed inner ears, and sprinkle with pink glitter. Allow to dry. Lift up batting at sides of forehead fluff, and hot glue bottom end of ears in place onto chipboard. Secure rest of the edge of batting. Finishing Details Punch hole close to round edge of sole for the tie to go through. Cut rickrack or ribbon 40â&#x20AC;?, fold in half, and poke through hole. Tie in bow, leaving space for hanging. For insole tag: Cut piece of scrap cardstock 4 1/2"x3/4". Cut ends into tails, folding as shown if desired. I cut a small piece out of a French book for embellishment, as shown. As a little girl, I was always encouraged to things. From create clothespin do lls to “inventi sories, inspira v e” accestion seemed to be everywher love for all th e! With a ings vintage a nd finding ch so many thing a ra cter in s, I found such joy in bringin to life -- espec g things ially little cha racters. From shows to crea d o ing art ting things fo r Need'l Love and Bethany L D es igns owe Designs, there never ce be an opportu a ses to nity to create! In Kansas City, where I’ve alw ays lived, it se is always thrivi ems art ng and enjoyed . I’ve been mar for over thirty ried years to my sw eet husband an best friend. W d e’ve been bless ed to raise our beautiful daugh ters, Samantha and Casandra, now on the “c and are razy course” o f grandparentin amazing little g to our boys. Along w ith the most w sons-in-law, m onderful of y husband Joh n and I always more the merri say, “The er!” It has alw ays been true! Springtime and sailboats go side by side, don’t they? Here’s a simple project made from on-hand household items that will enable you to make a beautiful boat to sail, store goodies, or even use as a place card at a birthday party. You can send it home as a party favor as well. When you set sail with a paper boat, there’s nothing but blue skies ahead. Happy sailing! The Boat: With an X-acto knife, cut the milk carton in half lengthwise so that, once cut, the top part will be the bow (point) of the boat. You may want to cut the boat slightly larger (deeper) than half of the carton so that it’s a little bit deeper. You also may want to cut the sides of the boat with a slight curve so that there is a gentle slope. If you’d like, you can bend the bottom of the carton into a slight point to match the other end, but I chose not to. Cut a strip from the remaining carton half (or use cardstock paper), approximately 1”x 5”. Cut two 3mm slices in an x shape in the center of that strip of paper. This is just to receive the mast later. Cover the boat inside and out with a paper such as newspaper or music paper. (I scanned a piece of toile fabric to cover the inside and outside of the larger boat, ledger paper for the smaller boats.) You can glue it on in bits and pieces, like you would when doing paper mache, or in bigger pieces like you would when gift wrapping. Also cover the piece of paper that is 1 x 5” at the same time. If you are using a dowel as a mast, you may want to cover it in music paper as well. Or another option is to paint the dowel (wouldn’t stripes be cute? ), or use a twig and leave it natural. Take the paper with the slits in the center, and put it in the center of the boat. Bend the edges so that the paper strip is taut and then staple or glue the piece to the inside edges of the milk carton. You may want to glue this slightly toward the front of the boat. This is the piece that will hold the mast in place. The Sail: Out of heavy paper, cut a large triangle approximately 8” x 8.5” x11” or 4” x 6” x 7” for the smaller sails. I decided to sew paper scraps on the largest sail, just cutting rough squares or rectangles and, patchwork-style, slightly overlapping the papers. On the smaller sails I chose to glue the papers. I added a flag to the top of one of the sails, and a photo of friends frolicking in the surf on another. On the place-setting boat, I covered the entire sail with names from a ledger book and added a vintage red Dennison label. However you decide to make yours, be sure to cover both sides of the sail. Another variation: Sew on fabric scraps for a patchwork quilt sail. To attach the sail to the mast, you can either glue or tape it on, using another paper to cover it, or you can make two small 1 centemeter slices in your sail, one toward the top and one toward the bottom, horizontally, and slide the mast on through those slits. The last step is to glue your mast to the bottom of the boat so it stands upright and straight. Tip: If you want to use your boat in water, you can cover over the paper with polyuerethane or clear packing tape. I covered the bottoms only, and the boats are no worse for wear after being sent to sea. Valentine's Day is my all-time favorite holiday! Itâ&#x20AC;&#x2122;s the only holiday where I will actually make cards and gifts for my friends and family. I already had my pink and red paint out when Amy called to see if I could make something for the magazine. I have a basketful of wooden and balsa wood things, you know, just in case, and I started to see ways to screw several together to make a couple of Valentine Gals to sit in the center of our table. Very simple and fun to paint, and a great way to use a few of the 20 magillion billion Valentine stickers I have collected over the years. Not much direction involved-- just go with the flow and in no time you'll have a couple of new little friends to share this sweet day with! by Mary Engelbreit Photograph by BEM Photography. Paper-mĂ˘chĂŠ is a favorite craft at House Wren Studio. Make a little hutch full of Bunny Lumps using Celluclay for a quick shortcut. Super, super simple and lots of fun to shape and bake. Big and little, each one has his or her own personality depending on the ears and tiny face. Tuck them into a basket or here and there around the house for decoration. Careful! They multiply like, well, bunnies! dry on a foil covered sheet in an oven at 200 for an hour. cut little ears from white felt. try making the ears odd shapes to mix and match. shorter, taller, fatter, thinner. paint the face using a tiny brush or a toothpick. black dots for eyes then the pink nose. Welcome the coming of Spring by creating this delightful door-hanging! Youâ&#x20AC;&#x2122;ll have fun combining vintage papers, nesting materials and a flocked bird to create a wonderful greeting for your guests...a sweet harbinger of Springtime blessings! 1 For the main base of the egg AND the overlying “pocket”: Print and cut out the egg template provided; Trace onto thin cardboard TWICE and cut out your two cardboard egg shapes. 2 Cut ONE of your egg shapes in half; this will be the overlying “pocket” that will hold your bird and nest. 3 Decoupage the front of the base portion of your egg shape. You will need to decorate only the top half since the bottom half will be covered by the overlying “pocket” and will not be seen. 4 Decoupage the entire front of your overlying “pocket”. 5 Using crepe paper or lace, trim and embellish your egg base and overlying “pocket” as desired. 6 Add German Dresden to the edge of your overlying “pocket”. 7 Glue your overlying “pocket” to the top of your base egg shape; GLUE ONLY AROUND EDGES! You are making a pocket, so the bird and nest can sit inside! 8 Glue your nesting materials, bird & eggs into the pocket. 9 Add a sprig of millinery flowers to the bird’s beak. 10 Make a double-layered crepe paper rosette and add a decorative cutout shape and text of choice to embellish the front of your overlying “pocket”. 11 Finish the back of your door hanging by covering the entire back with paper of your choice. 12 Punch a hole in the top of your egg and add ribbon of your choice to hang. Hang and enjoy! baskets Spring is such a lovely time of year - a wonderful time to remember the childhood magic of the Easter Bunny bringing sweets and trinkets on Easter morning. Inspired by those memories, these tiny baskets with a vintage flair can grace your table, become a whimsical necklace or decorate your dollhouse. dle and about 1/8â&#x20AC;? down on the inside and outside of the basket. (Or paint the whole basket.) Use plenty of paint to fill the crevices. Let dry thoroughly. Paint over the white area using your favorite pastel color. Let dry. Then, using a stylus, add tiny decorations to the painted area. Make dots for flowers and dashes for leaves. Try using a micron pen to get fine detail. Your painting doesnâ&#x20AC;&#x2122;t have to be perfect - just an impression of a flower will work! grass, deconstruct a pastel dish scrubbie by cutting it apart and unravel the knitting Spread a bit of Tacky glue into the bottom and sides of your basket using a cotton swab and fill it with grass. Hold the grass in place place while it sets. Can’t find a scrubbie? Use what you have on hand. Cut a 3” by 3” square of colored paper. Crumple it over and over until it gets very soft. Fold it up into a small roll and cut very skinny slices off the end with a sharp scissors. Unroll and use a tweezer to arrange the paper in the basket to look like grass. Or, use a bit of model railroad foliage. 3 Take a 1/2” ball of white polymer clay and a 1/2” ball of colored clay. Condition them together until color is smoothly blended. Add a bit more color or a bit more white if needed to get a pretty Easter Egg color. shape about 3/16” in diameter, then elongate it slightly, finally pinching the end with your fingers or against your tile to make an egg shape. Measure against your scale ruler (found in appendix) to check the size! It should take up just a little more than two marks the long way and a little less than two marks the short way! This project is designed in 1” to 1’ scale or 1/12th the size of real life objects. A real “Grade A Large” egg is 2-1/4” tall by 1-3/4” at the widest point. 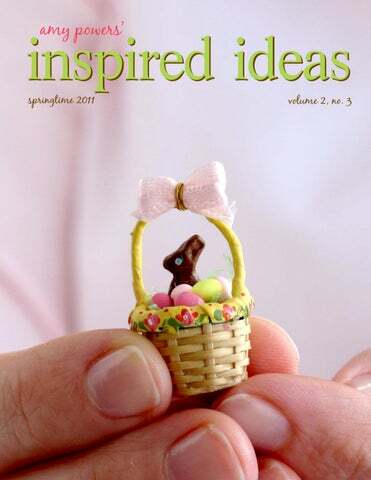 Use the scale ruler provided in the Inspired Ideas Appendix to help you make your eggs the right size... but don’t forget that candy eggs can be bigger or smaller than real eggs! Measure real life candies and convert them to 1/12th scale. eggs. Save the colored foil from your favorite springtime candies. (I like colored foil from Hershey’s Kisses.) Smooth the foil with your fingernail. Using a bit of Tacky glue on a toothpick, glue a baked egg to the foil. Then trim it to about 1/8” (or less) around with a manicure scissors. Smooth the foil around the egg adding a bit more glue if needed. Make some chocolate eggs, too! Add a fancy bow! Here’s a clever trick for making a perfect tiny bow: Using clear packing tape, attach a regular size household fork to the side your counter or worktable so that it is standing upright. Cut 5” of 1/8” satin ribbon and wrap around three tines of the fork as shown. (To show the wrapping technique, I’ve shown the ribbon separated. Move it closer together to wrap with wire.) Use a bit of tape to hold the ribbon ends to the fork for the next step. Using a fine piece of wire like gold beading wire (or one from the inside of a twist tie) and going through the tines of the fork, wrap the wire twice around the middle of your ribbon, pull tightly and twist to secure your ribbon into a tiny floral bow. Your wire will be a bit off-center. Reposition the shorther loops onto the end tine and push down onto the fork. Pull on the wire with your fingernails to center. Fluff the loops of the bow with the ends of the fork and your fingers. Trim the ribbon ends as desired. Attach to your basket with the wire, clipping the ends short to hide them. are cast from unknown metal alloys and are intended for use by adults only. To prepare the metal, wash it with dishwashing liquid to remove any release agent. Then prime with a light primer like spray railroad model primer. Paint with several coats of chocolate-color acrylic paint. Let dry. Using a fine ball stylus, paint a pink dot for the eye. Let dry and then paint a smaller blue dot off-center for the iris. Allow to dry. Then seal the bunny with acrylic matte varnish. Assemble your basket! Arrange your eggs and candies in the basket. When you like your arrangement, glue them in place using Tacky glue on the end of a toothpick. Here comes Peter Cottontail! A limited number of kits are available to create your own Easter Basket. Metal bunnies, baskets and filled baskets are also available separately. E-mail Pat at PMW_Kits@me.com for details. Keep your hands and work area very clean when working with polymer clay, especially pastel colors. Every speck of dust shows. This is no time to be wearing your fuzzy black sweater! If you make some eggs with unwanted specks, cover them with foil or put them on the bottom of the basket! Or paint them! Or call them speckled eggs and show them proudly! Moisturizer cuts residue from polymer clay on your hands. Just rub some in and wipe on a clean paper towel. I keep little bottles from hotels just for this purpose. Baby wipes also work very well. Rubbing alcohol removes polymer clay residue from tools and baking tiles. Don’t worry about making perfect miniatures! No one will see them as close up as you do while you are working. Just aim for making an impression. Your viewer’s imagination will fill in the gaps! piece of cake Both decorative and practical these pincushion rings are a fun way to inject some whimsy into your sewing tools. Because there is no sewing involved (only gluing) they would be an ideal craft to try on a rainy afternoon with the kids. Creativity comes in when you choose your felts, vintage trims, buttons and beads. Vibrant or muted can be the end result, depending upon your mood! Start by choosing a piece of vintage trim; then pick out some felt in a color or colors that complement the trim. Then choose a medium to large button (not a valuable one!) in a complementary color. The size of the button determines the size of the roll. Place a dab of glue at the short end of the felt. Roll up to desired size and glue end. Wrap outside of with vintage trim, secure in place with glue. Glue onto button. Cut a 3 inch piece of measuring tape. Measure length, or wrap around your finger to correct size, making a completed circle and glue. Attach to underside of button. Embellish your pincushion ring with a straight pin augmented by vintage beads. k, Pennsylvania, and her Stacey Bear is an artisan from Yor and nature. Her assemblage work is inspired by history, science and feature original paintboxes convey a mood of times past h found objects. ings of acrylic on board enhanced wit untry Living, Victoria, Her work has been featured in Co ry Englebreit’s Home Better Homes and Gardens, and Ma n named in Early Companion magazines; she has bee t Craftsmen and her American Life Magazines’ 200 Bes today show. work has also appeared on NBC’s s 19th century stone She works in a studio in her family’ by original antiques and farmhouse and is greatly influenced create her craft according holiday collectibles but prefers to hts of fancy. to her own whims and creative flig many fine shops and galStacey’s work is available through luding the American Folk leries through out the country inc several quality Folk Art Art Museum in New York, and at nsylvania, Massachusetts shows in Virginia, Connecticut, Pen and California. The Truffle Pigs are Sta cey Bear, Deborah Hartw ick & Kim Stout. We are 3 artist fri ends who met and are int erested in anything and everything vintage and antique sew ing-related-buttons, ribbon, trims, pincushions, thimbles, ch atelaines, knitting, needlework. W e met doing art shows an d discovered a mutual love of an tiques. Because all our stu dios were overflowing with vin tage supplies, we decided to join together as antique dealers doing shows sev era l times a year. We continu e to meet every spring an d fall for marathon buying tri ps to search out new tre asures. We also sell our own de signs at our antique show s: pincushions, emeries, sew ing boxes and sewing related jewelry. bunnykins I have a stack of white felted sweaters that come in handy for all kinds of projects. I cut one up for this Bunny Bag and stitched it up to make a soft Easter basket. Perfect for collecting eggs or filling with chocolates for your little bunny. Make it in a few simple steps. love bug This wee love bug is a such a cute little guy! I’ve had this idea for a tender-hearted buggie fellow for awhile now, so I was so excited to contribute it to Amy’s magazine! He would be perfect to create as a gift for someone dear this Valentine’s Day! Needle-felting is a simple, fun technique that you can use to bring your imagination to life with very few materials. This project is perfect for a beginner and can be personalized to your heart’s content. *Please note all needle felting should be done on foam work surface. For the sake of aesthetics, I have photographed the work without the foam, but be assured, it is essential! To form body, wind a tuft of pale pink wool roving tightly around a wooden skewer to form an oval shape 3â&#x20AC;? long. Twist between fingers so wool begins to bind together. Slip off of skewer and transfer to foam pad, and continue felting until firm and about 2â&#x20AC;? long. To make head, wind a tuft of pink roving into a ball shape and felt, turning as you go, to form a firm ball. Thread a sewing needle with black upholstery thread. Insert needle into bottom of head. Stitch eyes onto head, and stitch mouth and eyebrows, exiting again through bottom of head. Tie off, and trim excess thread. Add rosy cheeks using blush and a Q-tip. Make heart-shapes for antennae from paper clay. Insert thin wire into bottom of hearts and allow to dry. Coat in a thin layer of glue, and cover with silver glitter. Attach to head by threading wire onto needle and stitching through and tying off at bottom of head. Use thread or thin wire to attach head to body. Tie off at bottom, and trim excess thread. Cover any exposed thread or wire by needlefelting a bit of wool over top. To create arms, make a hole in body by inserting a sharp tailor’s awl or thick needle. Place a dab of glue on chenille stem and place in hole. Bend end of one arm and place bouquet of paper flowers, securing with a dab of glue. Form feet with paperclay, insert wire legs into feet, and allow to dry. Paint feet with pink paint, and dip in pink glitter. Trim wire legs to 2”. Using tailor’s awl or thick needle, poke holes into bottom of body. Add a dab of glue to wire legs and place in holes. Cut wings from red felt. Place small tufts of wool and gently felt into circles. Attach wing to bug back with felting needle. Cut fabric into a circle a bit larger than wooden disc. Glue to disc, snip edges of fabric into tabs and fold under disc, adhering tabs to bottom. Finish bottom by gluing a circle of felt to cover. Glue mini rick rack around edge. Glue love bug to base, holding in place until set. Needle Book This sweet little "purse" needlebook is not just a place to house your needles and pins, but with little pockets it will hold your stitching tools and floss as well. And maybe even your coffee punch-cards, gum, drivers license and car keys. You never know when you'll have an on-thefly opportunity for a night out stitching with friends. Please note: This project is for personal use only. manufacturer's instructions. Peel off paper backing. fabric's printed side right-side up. Press. pencil onto felt/fuse/fabric unit. Trace the felt pocket pieces with the pocket templates. Cut. 4 Position snap/VelcroÂŽ into desired position. Attach by sewing. 5 Blanket stitch around all edges of purse unit. 6 Pin two felt pocket pieces together. Blanket stitch both sides to join them to form a tube. 7 Layer and center the joined pocket piece unit to purse unit. Open ends of the tube facing the purse handles. Next layer the remaining felt pocket piece. Make a stitch vertically down the entire center to join all units. 8 Fold up center felt pocket piece so both sides meet. Pin. Blanket stitch sides to form the third (and center) pocket. ce first learning Monica has been embroidering sin the 3rd grade. the craft in her Brownie Troop in chery blossomed Monica's love of quilting and stit from the Land many years later when she moved d of Not So of Sunshine (Hawai'i) to the Lan ated her own Much Sun (NW Oregon) -- and cre and floss. 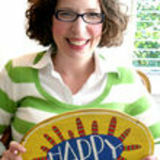 sunshine and color through fabric ing patterns Many of Monica's quilting and sew Homes and can be found in the pages of Better s, as well as on Gardens: Quilts & More magazine om. Monica her blog, www.thehappyzombie.c of Japan, and her designs fabric for Lecien Fabrics m" debuts newest line "Happy Mochi Yum Yu Spring 2011. ul Astoria, Monica makes her home in beautif ngest son. Oregon, with her husband and you d Modern Quilt Monica is a member of the Portlan time sewing Guild and spends much of her free g of besties... the and mischief-making with her gan Sweet Hot Yams. do e - c do e Like many kids growing up, I had Fisher Price toys. But the ones that have the fondest place in my memory are the mismatched seconds, like the horse with 4 different colored legs, that my sisters brought home for me since they actually worked at Fisher Price! Sadly, I no longer have any of those toysâ&#x20AC;Śbut luckily, about 4 years ago, I moved to Kansas where the thrifting is plentiful. So I started to collect vintage Fisher Price. I also started a blog about that same time, and sharing my thrifting finds was one of the things I posted about. Pretty soon I was thrifting little things just because I enjoyed taking photos of them. I even started to use the vintage paint by numbers I was collecting as backdrops. It was a completely unplanned series of events. I still canâ&#x20AC;&#x2122;t believe people actually purchase my prints to hang in their homes, but it makes me crazy happy and flattered that they do! On-the-Go on-the-go stitch kit I have always longed to be an organized gal. A REALLY organized got-it-together woman. One of those girls who have a place for everything and everything is put away in that spot. But. I'm 40 years old now, and it's clear to me that it's just not going to happen! Oh, I've come a long way. (Ask my mom.) My organizing just looks different. For example, at this very moment, my embroidery floss is right where I know it is. It's all smoooshed into one large jar. I can dig in and get the color I need without much untangling. Usually. However, I do love to make things cute. So, here is my attempt at an organized "On-the-Go Stitch Kit". Clean out the watercolor tin. Cut the heavy paper into strips about an inch-and-ahalf wide. The length will just depend on the size of your tin. My strips needed to be three-and-a-half inches long (because the width of the tin was an inch-and3/4ish). Fold strips in half. I cut a spool-shaped template the same size as the folded strip (1 3/4" for me), and created the paper spools. Since I am sharpening those organizing skills, I added Dennison labels so I could keep track of the colors I am using - like some professional stitchers do. (This is very funny to me, because I only buy my floss at garage sales and Goodwill, and I have never paid attention to the color numbers before in my life!) Begin winding the floss around the spool-shaped strips. If you make little slits in the spools, it's easy to grab the floss to get started and will keep it from unwinding. Add the magnets to the bottom portion of the spools. Cut two pieces of felt to hold needles for your kit. I used my pinking shears, glued the felt pieces together, and embroidered a little lazy daisy for pretty. Attach a magnet to the back. Using stamps or stickers, personalize your stitch kit with a message that speaks to you! Miss Lynn has sp ent all her days creating and crafting. As a littl e girl making bead s using dried up marshmallows and pink fingernail polish, to a young teen puttin g together collage pins that made her mother sure she needed therapy, the need to create has always been as natural as her need to br eathe. Lynn spends her days with a classr oom full of fourth graders, using any and all creative methods to motiv ate these precious little people. Home is her favorite place to be, surrounded by the lo ves of her life â&#x20AC;&#x201C; he r husband, Grant, and their children, Elli ott and Beatrice. She espe cially enjoys pidd ling around in her art room, cutting an d pasting, making pretties. www.createbreat he.blogspot.com. hippity hop Just in time for the Easter holiday, a simple and sweet Easter project! Young ones will be delighted with this cute little bunny and mushroom egg. The bunnies are made with 3 different sizes of pom poms and a bit of felt, and the mushrooms are made from eggs. I used wooden eggs purchased from a craft store. They were particularly great because they were already painted white and have a flat bottom to stand upright. You could also use blown eggs, but they can be a bit messy and quite tricky. However you make them, have fun and Happy Easter! Mushroom Egg Use the pattern found in the template to cut mushroom cap from red felt. Then overlap access to create wide cone and glue into place. Use a hole punch to make white felt spots and glue them to mushroom cap. g cut ears using pattern found in appendix. Use a paper punch to make circles for the bunny nose and eyes. for personal use only. Commercial use prohibitted. like mple materials I like taking si ipe s, cloth, or p felt, pom pom aking fantastic cleaners and m are fine art, crafts things. Unlike age. eryone of any accessible to ev . craft tutorials te ea cr I y h w That is st a ymaker for ju I've been a to ma d I love it. Fro n a e m ti rt o sh ing ave been draw young age I h making 3cartoons and ys of my dimensional to seemed drawings just ral to be the natu f my progression o art. I have a confession: I collect paper. Old paper. New paper. Paper Dolls. Paper flowers. Paper streamers. Books full of paper. Scraps of leftover paper from other projects. None of this would be so bad if I would use each piece. (I am after all a big believer in using what you have – no fancy hand towels that no one is allowed to touch in my bathroom.) But the truth is, I don’t use it all. And it stacks up. And then the guilt sets in, which I am sure you would agree is not great for the creative spirit, which results in the paper sitting untouched still and then the cycle starts all over. So in a fit of resolution, this year I am trying to use my paper and my scraps more. Buy less. Use what I have. That is the plan. them to the stack of untouched paper ephemera in my studio, I wanted to honor her gift by finding a way to use them sooner rather than later. And I must confess, I really wanted to play paper dolls. This project can be interpreted many different ways and can involve as many hands (big and small) as you want. Besides paper dolls, you could use illustrations from vintage books, the fronts of pattern envelopes, images from greeting cards, large stickers or even hand drawn characters. Need a theme to find inspiration? Give these books instead of Valentine’s Day cards. Or fill an Easter Basket with the supplies for little ones to make their own books while they wait on Easter Dinner to be ready. Or perhaps just For Christmas, my mother gave me a make a few to take on a long road trip. great set of Betsy McCall paper doll Just remember – this is a Topsy Turvy reproductions. Rather than adding project, so have fun and mix it up a bit! Cut your scrapbook paper scraps down to a 4”x6” size. I used 22 different patterns, but you can use the same pattern or different ones throughout your book. Cut your images and/or paper dolls out (this can be a great distraction for little helping hands.) Set aside. In the center of the card, paste the paper doll to the scrapbook paper, making sure to place your paper dolls in the same place on each card. Dress your doll by glue-sticking her dress (make sure to cut off “tabs”) to her. Add hats, shoes and any other accessories she has, using this same method. Let dry. Next, cut 9 of the cards in half, creating two 3x4” cards from each image. Two Cards will need to remain whole to use as your front and back covers. Bind together using the album rings. Ta-da! A Topsy Turvy Flip Book is born! Jenny Heid and Aaron Nieradka created this beautiful vintage inspired wallpaper to share with you. Print it from the appendix and use it in your craft projects! I have always admired vintage chocolate molds and how ornate there designs are. When I came across this vintage basket mold that I used for this project, I could not resist buying it. I thought it would be fun to make the basket out of something that would last longer than chocolate. Paper clay is really easy to work with. It dries very quickly so I found it to be a great medium to work with. I have also used paper clay on a large chocolate egg mold and it makes a great candy container. And just imagine how adorable it would be to make a paper Santa out of an old Santa mold, or an Easter bunny! The possibilities are endless. Materials ~ Basket mold (I used a vintage candy mold which can be found at an antique mall or on ebay) ~ Fast-drying clay (I used paper clay) ~ Pipe cleaner (I used a white one) ~ Glue ~ Paint ~ Velvet ribbon ~ Small flower ~ Easter grass ~ Wire ~ Beads (that fit through the wire) ~ Sand paper (fine grade) ~ Awl This is a fun little project that would be great used as a party favor, or you could put name tags inside for a place sitting. You can fill them with eggs, candy or a gift. er through the hole, and, using an awl, wind the end of the pipe cleaner around it to create a closure. Repeat on the other side. Next cut the ribbon to fit the handle and glue it around the pipe cleaner. You can either add more ribbon and flowers to the basket without painting it, or paint the basket and then add flowers to it. Fill the basket with Easter grass and goodies. I like to put decorated quail eggs or candies in mine. They also make great baskets to present jewelry or other small gifts in. You can also make the handle out of wire. I just made small holes into the top of the basket, evenly on opposite sides, and glued the wire into the basket. I strung gemstones on my example, but you could use pearls or rhinestone beads. I love incorporating all kinds of found objects into my jewelry. I started using miniature salt shakers a few years ago and am still exploring all of the possibilities. These pendants look elaborate but are actually quite easy to make, even if you arenâ&#x20AC;&#x2122;t a beader. The hardest part is deciding which beads to use because there are so many wonderful styles and colors to choose from. I purchase mine in the Czech glass section of my local bead store. If you donâ&#x20AC;&#x2122;t have a bead store nearby, there are lots of online sources for beads as well. I usually find my salt shakers at antique shops. Since they are no longer a popular item for entertaining, you can often get them for a good price. This pendant is very versatile and once you make the garden version, you can explore lots of other themes by adding charms, pearls or other small tokens of your choosing. The lid screws off of the base, so it is the perfect place to tuck a little love note or affirmation. You could also put a small amount of fragrance on the felt, and enjoy the fragrance all day. Materials ~ Miniature salt shaker ~ Bird-shaped bead ~ 1 flat glass flower bead, approx 0.75” in diameter ~ 6-8 glass flower beads, drilled vertically ~ Size 15 seed beads green for stems, and purple for the ends of the flowers ~ 1 dozen 3mm green crystal beads ~ 1 dozen 4mm clear crystal beads ~ 6-8 green leaf beads ~ 1 headpin ~ Two 1” squares of felt ~ White glue ~ Necklace chain or ribbon ~ Beading thread and needle -- any kind will do, as long as it can fit through the holes when it is doubled. 1. Make a hole. Unscrew the cap of the salt shaker, and set it aside. Place the base upright on a hard surface, and use an awl or a pointed nail to start a hole in the base of the salt shaker. Then, turn the base upside down and gently work the awl into the hole, going from outside to inside. This ensures that there won’t be any sharp edges sticking up. If your salt shaker is sterling silver, the base will probably be very thin, so be gentle. 2. Assemble the top. Place a 3mm crystal bead onto the headpin and insert it into the hole you just made in the base of the salt shaker. The bead should be on the inside of the shaker, with the headpin sticking out of the hole. Then, on the outside of the shaker, stack the large flat flower bead, a clear crystal, the bird bead and a second clear crystal onto the extended headpin. Support the flat end of the headpin by putting your thumb inside the shaker. Use your other hand to bend the headpin at a 90 degree angle. Use jewelry pliers to make a closed loop on top of the stack of beads on the headpin. Be sure to make the loop big enough to fit over one end of the chain. Set this piece aside. 4. Create the flower dangles. 3. Line the lid. Cut two small circles of felt that will fit snugly inside the lid of the salt shaker. I usually press the lid into the felt and twist. It will leave an indentation that can be used to cut the circle. Place one circle of felt inside the cap of the salt shaker. The felt will help support the beadwork. Most salt shakers have two concentric rings of holes. Start beading on the inside ring. Thread the needle and put a knot at the end. Start on the inside of the lid and put the needle through one of the holes. Try to get it in the very center of the hole so that the thread doesnâ&#x20AC;&#x2122;t rub against the edges of the hole when the pendant is being worn. Thread beads in this order: 3 mm crystal, 4 mm crystal, flower bead, purple seed bead. Go back through the flower bead and the two crystals and put the needle back in through the same hole in the salt shaker. Since the needle only passed through the purple bead only once, it will serve as an anchor for this set of beads. Repeat until all of the holes in the inside circle are filled. When you have filled every hole with a dangle, tie off the thread and cut it. Then put a small amount of white glue on the ends of the thread. Put a little more glue onto the felt and glue the second circle of felt onto the first one. This covers up the stitches and makes the inside of the lid look neat. 8. Complete the necklace. 5. Create the leaf dangles. This time you will be going around the outside circle of holes. Make sure that the leaf dangles are shorter than the center flower dangles. The flowers are the prettiest part and youâ&#x20AC;&#x2122;ll want to be certain that they can be seen. Push the needle through one of the holes in the cap. For the first dangle, thread one seed bead, one green crystal and one leaf bead. Go back through the crystal and seed bead and back up through the same hole in the cap of the shaker. For the next dangle, thread three seed beads, one green crystal and one leaf. This dangle will be longer than the one next to it. Complete the circle, alternating between long and short leaf dangles. After the glue has dried, screw the salt shaker lid onto the base to complete the pendant. Thread the pendant onto a chain or ribbon and enjoy! What, you may ask, are these little creations? They are for waxing your thread! You simply run the thread between the beeswax and your thumb to apply the wax. It makes your thread smoother, stronger and less likely to knot up. It is especially helpful to wax linen thread as it makes it easier to pass through fabric. And, since wax makes thread slightly stiff, this is a perfect way to make whiskers for little creatures. Iâ&#x20AC;&#x2122;ll show you how to make the flower basket. Follow the same basic instructions for making the Frozen Charlotte ones, skipping the steps for the basket handle and flower preparation. Large metal thimble (for mold) Beeswax 50 gauge wire Silk ribbon Millinery flowers Wire snips/scissors/tacky glue Jam jar with lid Salt Sauce Pan Cut a 4â&#x20AC;? piece of 50 gauge wire and bend into a U shape. Use pliers to bend ends vertically. Cut an 8â&#x20AC;? piece of narrow silk ribbon. Put a dab of tacky glue on the wire and adhere ribbon end. Wrap ribbon over wire, fixing the end with another dab of glue. Choose a small bunch of millinery flowers (or make some from stamens and crepe paper), and use a fine wire or thread to fasten at the opening of the U shape. Trim any extra wire. In a saucepan of water, place a small jar (like a jam jar) holding beeswax. Boil the water until the wax turns to liquid. Place a large metal thimble in a lid filled with salt (to hold it vertical). Pour liquid wax into the thimble, just to the brim. Place wire handle with flowers into the wax, and hold steadily until the wax sets up. You may blow on the thimble to help cool the wax. Set aside to cool completely. Gently pull out of thimble, and you have your waxer complete! *A small spray of olive oil or Pam inside the thimble will speed up the release process. s Massachusett I was born in up Ohio. Grew and grew up in antwoods and w playing in the y Ross or ing to be Betse in eceived a BFA Sacajawea. R rt d a MAE in A n a te ta S io h O Fine Arts from derick ght Art in Fre u a T . D IS R m Education fro of years for a number d n la ry a M County oastal y's business, C il m fa y m to before going in nd ly in textiles a ri a m ri p rk o w I Pet Products. For the mediums. g in in b m co ceramics, often ony to creates harm g in k a m f o ss me, the proce tal. I essly sentimen el p o h m I' s. it of disparate b a possibly have ld u co t a th g save everythin work of little bits to ts lo e v a h I future use, so with! with kids. It is simple and looks great when finished. You can try other materials (raffia or strips of fabric) to make a different kind of nest once you get the process. Fill the nest with tiny eggs and make a bird to sit in the nest, waiting for the eggs to hatch. Might be a perfect place for that special Easter egg, too. Happy Spring! Step Two: Making the Nest Bend and squeeze together the end of a long pipe cleaner into the center of the “spider.” Start wrapping it, weaving it over and under the five arms, around and around you go, firmly against the previous row, until the nest is the size you want it to be. If you run out of pipe cleaner, simply twist another one to the end of the first. Step Two: Adding Branches & Leaves When your nest is just the right size, you may cut the ends of the “arms” and tuck them into the nest. Or, leave the extra length as branches and add felt leaves to the ends. love birds A week before Valentineâ&#x20AC;&#x2122;s day, one of my students wore a darling little shirt to school with a couple of sweet love birds on it. I was enchanted with the design and decided I wanted to create a paper collage using the love birds as my inspiration. I called my studentâ&#x20AC;&#x2122;s mother with my unusual request, asking if she would send me a scan of the little bird image. She laughed and explained it was her daughters favorite shirt. In fact, she kept trying to wear it everyday even though she had grown a bit too big for it. First, I googled â&#x20AC;&#x153;bird silhouettesâ&#x20AC;? and printed off my favorites. Here is the sketch i did to make a pattern. I cut out both birds using some pretty french book paper and set them out on my background paper. I never know how collages will grow, so I just placed (instead of gluing) the birds in the middle of the paper, and I drew the swing and text around them. Next I sewed along the swing sketch 3 times. I really like the metallic silver thread by Coats. However, it is rather fragile for sewing on paper, so I always use regular thread in the bobbin. You may have to roll the paper up like this to fit in your sewing machine. Before I glue anything down, I always letter the text, just in case I choke. Using my favorite 10/0 royal gold paint brush and some Golden's fluid acrylic in Titan Buff, I painted along my pencil lines first. After the paint is for sure completely dry, I carefully erased any left-over pencil lines. Then I outlined the letters using a 005 micron pen. I began to place some small millinery flowers around the swing. After I glued all the elements in place, I added a frame of crepe paper ruffles and accents. I live at the base of the beautiful Rocky Mountains with my husband Matt and our four children. We live in a little town that is small enough I can ride my bike to the post office to mail my etsy packages. During the winter I am content to spend the whole day in my studio watching the snow fall out my window. In the spring I love growing flowery things in my garden. English roses, lilacs, and daffodils are my favorites. I teach school during the year so the summer is always a wonderful time to look forward to. I bike up the canyon early in the morning before the sun is up. I bike all summer and fall and watch the colors change alongside the trail with each passing day. Valentine Pocket A little heart pocket is perfect for holding little heartfelt goodies to give to someone special -- a lucky penny, a chocolate heart, a few red hearts cut from paper, a sweet bracelet. Just a little something to give to someone you love. Jone shares the pattern for making this sweet papercutting. Just fold the paper and follow the cutting lines and voila! The pattern is found in the appendix. happy What makes you happy? Which people, places, things, quotes, bible verses, sights, sounds? Take a little time to sit and think about being happy…remember the joy. Think about times that made you laugh like crazy…memories of good times with good friends…moments of love with family…it does not matter whether it was 25 years ago or 25 minutes ago. This is not a project that needs to be in chronological order…all it needs to be filled with are the people, the places…the little things that make you happy..and then repeat them to create a habit…The Habit of Happiness! This project was created to be displayed on a “clip board” with binding rings attached to display your pages, but can easily be adapted to fit inside your favorite chipboard book or binder! jUST THE FACTS: Several pages in this project were simply created to hold the thoughts, ideas and memories either in just words...or just photos. A place to put just the facts about happy! Create this page by trimming a piece of patterned paper to measure 7” x 5”. Line up your first page with this page to get the “holes” in the right spot and punch those out! Layer on a piece of patterned ledger paper. Example shown is 6 ½” x 4”. Embellish it simply by inking the edges and placing a border sticker along the bottom. Don’t have any border stickers? Just create one using patterned paper and adhesive…or maybe a strip of ribbon! DIY Die Cut Embellishments If you’re anything like me, you’re very likely to have a stash of chipboard embellishments. If so, be sure to use what you have. But it is always a GREAT idea to create some of your own too! I am an old-school “crank” die-cutter, and my Big Shot by Sizzix has a million miles on it! The reason I stick to this oldie-but-goodie is because not only can you cut paper… you can cut canvas, chipboard, sandpaper, felt, thin metals, cardboard and plastic, and if you match up a great “material” with a great die..The possibilities are AMAZING! Take a little time to grab some materials and play! This page was created using a 5” x 9” piece of Girls Paperie Kitch Party Pennants #GP65097 and will be home for photos. Create a border like the one shown in the photo by following these instructions: 1 Cut a strip of patterned paper ½” x 5” and ink the edges. Adhere to the lower edge of the page, approx. ½” up from the bottom. 2 Using the Sizzix Bigz Die Flourish Swirly 656765, cut one piece using a coordinating patterned paper. Ink edges and adhere to the center, right above the strip you created in step one. 3 Cut several different sized hearts in coordinating papers, ink edges and accent the Swirly Flourish. Use foam pop dots to add dimension. Tag! You’re it! There are a few pages in this project created using large manila hanging tags. To use them, simply turn the tag so that the hole is pointed towards the bottom and punch your holes on the top. These tags are the PERFECT size to hold a 4” x 6” photo with a little room on the end for journaling or embellishing...or create a “mini layout” using coordinating papers, stickers and scraps of felt! To create a tag similar to the one shown: 1 Adhere a piece of patterned paper measuring 4” x 7” to the tag BEFORE punching holes. 2 Create a “Home” by using the “H” sticker in the Girls Paperie Kitch Sticker Market GP65098. Place the sticker on a piece of chipboard or cardstock and trim, leaving a slight edge. Ink it! Now adhere that piece to a slightly larger piece of patterned paper, trim leaving a slight edge and ink it! Using a foam pop dot, adhere your “House” to the center of the tag. 3 Create a “roof” for your “home” by cutting a triangle shape using coordinating paper. Adhere the “roof” to a piece of chipboard, ink edges, and adhere with a pop dot right above the “house” 4 Finish by gluing a little red felt heart to the “H” and top with a word sticker...like “home”!